Teeth sensitivities can be one of the most frustrating things your mouth deals with on a daily basis. For example, a tooth sensitivity can make it extremely hard to eat your favorite foods. Many people with tooth sensitivities have trouble switching from hot to cold items. So if you want to stop eating that bowl of hot soup and opt for a cool drink of water, your teeth might cause you some pain. Before you know it, it’s taking you three times longer to eat a meal than it would have otherwise. Available treatments for tooth sensitivity are lacking in a number of ways, such as being ineffective and predisposing patients to bacteria and cavities. 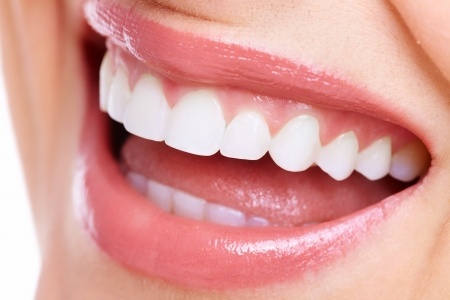 But researchers have now developed a new material to better protect sensitive teeth, using green tea polyphenols. For people with tooth sensitivity, drinking something either too hot or too cold causes sharp and often intolerable pain. Tooth sensitivity and toothache reportedly affect well over 25 percent of people in the United States. The reason that tooth sensitivity occurs is because the protective enamel layer on the tooth’s surface gets eroded, thereby exposing the tooth’s next layer of bony tissue, which is called dentin. Dentin contains small tubes that are empty inside, and when the ends of these microtubes are open, they allow for hot or cold liquids to go straight to the tooth’s nerve – thus causing a sharp, jolting pain. People with sensitive teeth are also more prone to developing cavities due to these microtubules being exposed to bacteria. Currently available treatments are based on the occlusion, or closing, of these microtubules using a material called nanohydroxyapatite. However, this material is neither resistant enough nor able to block bacteria from penetrating it. Due to the vulnerabilities of conventional treatment, a team of researchers – led by Dr. Cui Huang, of Wuhan University in China – set out to explore alternative therapies. A new study detailing this innovation has been published in the journal ACS Applied Materials & Interfaces. Dr. Huang and colleagues set out to create a “versatile biomaterial” using the traditional material nanohydroxyapatite but adding a key ingredient: a green tea compound. The compound is called epigallocatechin-3-gallate (ECGC), and it is the most active polyphenol in green tea. Previous studies have shown that this compound can effectively battle S. mutans. The scientists encapsulated this mix into so-called mesoporous silica nanoparticles (MSN). Due to the medium size of their pores (or mesoporosity) and their surface properties, MSNs are widely used as drug carriers. Using a technique called confocal laser scanning microscopy, the researchers tested the ability of the newly developed biomaterial to block the formation of the biofilm that S. mutans normally forms on the dentin’s surface. Additionally, they performed biological assays and cytotoxicity tests on pulp tissues of extracted premolars and third molars, or wisdom teeth. The tests revealed that the new biomaterial successfully blocked the dentin’s microtubules and reduced dentin permeability. Additionally, the material released EGCG continuously for more than 96 hours. The material also proved to be resistant to erosion and abrasion, as well as protecting against the S. mutans biofilm. The material “significantly [inhibited] the formation and growth of S. mutans biofilm on the dentin surface,” the authors write. To their knowledge, this is the first time that such results have been obtained. Dr. Huang and colleagues are hopeful that this material will successfully treat tooth sensitivity. Isn’t science amazing?! It’s incredible what discoveries we are making here in 2017 to be able to combat something as frustrating as teeth sensitivities. Think of it – soon, sufferers may no longer think twice in drinking a cold glass of water after a few bites of hot soup. In addition, they won’t have to worry about planning out their meals, or only sticking to “cold” or “hot” meals again! Researchers are unsure of when dentists will be able to utilize their findings in their medical practice. However, this is great news for those with tooth sensitivity sufferers, and provides hope to an end of their frustration and suffering.